Last week we reported upon the impending release of Futuremark's VRMark Cyan Room DirectX 12 benchmark. The new synthetic benchmark software was released yesterday. Coinciding with its release, AMD published a blog post about how VR and DX 12 are natural partners and, of course, highlighted how AMD hardware is a great choice for modern VR gaming and development. AMD's Scott Wasson didn't just provide some background chat about VRMark Cyan Room, he also published some results charts with benchmark scores and average fps scores. As you can see above, the Radeon GPUs have solid leads compared to the selected Nvidia competition in this new VR DX 12 test. Before we go further we must address the elephant in the room: yes it's disappointing that AMD didn't include the Nvidia GTX 1080 Ti in its testing. However, AMD reckons the competitors for the Radeon RX Vega 64 and 56 are the Nvidia GeForce GTX 1080 and 1070, and is sort of sticking to that story. Sort of - because we see the GTX 1070 Ti in the results tables here. The FPS scores reveal that all the cards tested, bar the GTX 1060 6GB, are capable of that minimum standard for VR - pumping out at least 90 fps for smooth, comfortable VR experiences. 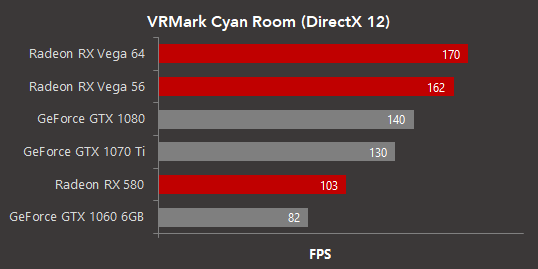 Remember that Futuremark VRMark Cyan Room DX12 is not the most high-end VR benchmark from the company. It is designed to "show how using an API with less overhead can help developers deliver impressive VR experiences even on modest PC systems". Unfortunately you will still find that many VR apps and games still use the older DX 11, but that is starting to change in favour of DX 12 and Vulkan, which both make better use of the multi-core/thread hardware resources in your PC. If you are interested in VRMark, it is available with 75 per cent off in the current Steam Sale. That makes it US$4.99, or £3.74, until 28th Nov. While it's a pity about excluding GTX 1080 Ti - the Vega 64 is similar in pricing to a GTX 1080 so AMD does have a point about the Vega 64 being a rival for the GTX 1080. The Ti model is about £150 more roughly from memory. They haven't included a Titan card or a vanilla 1070. Test setup and driver versions aren't given and they haven't marked the MSRP/street price on the charts or looked at performance-per-watt either. As usual with these things it's a very limited comparison. However that doesn't detract from the good numbers at similar price points for the Vega cards, I'll definitely wait for someone independent to run the tests before I make much judgement though! Translating that to this benchmark, it would mean that 1080ti would again be about 30% faster than 1080… or FPS wise, it would be about 10-12FPS faster than Vega 64… approximately. Trouble is, most gaming developers never really optimize their games for AMD hardware properly. The only games that do this kind of thing would be some DX12 titles and those made with Vulkan. But yes, I do agree we need driver versions and everything else to see proper comparisons. Still, one has to keep in mind that the higher power consumption of Vega is not down due to the architecture itself… it mostly comes down to the manuf. process used. 14nm process used by GLOFO for Vega is not suited for high clock speeds, hence why Vega consumes as much power. Incidentally, the upcoming 12nm used by GLOFO will be suitable for high performing parts, so Vega and Ryzen will both be able to be clocked much higher. Vega however would benefit a lot more from increasing HBM frequency as most performance increases stem from overclocking the HBM (not the core). On a 12nm manuf. process though, it is possible that Vega could easily be clocked as high as Pascal and also with much higher memory clocks, resulting in it surpassing Pascal easily (considering that Vega is operating on lower clocks than Pascal to begin with). The fact AMD is getting these numbers on a manuf. process not suited for high clock speeds is really good. I think the fact that AMD has lifted it's products performance up to compete more on the same playing field is great news for all of us. Now we are getting back to having a proper 2 horse race again and competition will help to push along good things for the consumer. I agree that the 1080ti is in another price bracket altogether, so until AMD brings out a direct competitor, there is no point in including it and besides, we all know it will outperform the AMD products as they stand at the moment. AMD was just showing the direct competitors and initial info on how it competes within that price bracket - in Australia if you do a good search, both the 1080 and Vega 64 start around the $700 dollar mark whereas the 1080ti starts at $1000. And they did leave out a lot more possible test tables and test equipment/methods info. but I am sure that will be done in depth by a lot of people in the near future. As for how the AMD cards are not fully optimized yet, we can only hope that developers will now start taking full advantage of all the benefits on offer and AMD can come out with good drivers. Let's see how it pans out in 2018.